Visual Kei -(ヴィジュアル系, vijuaru kei) is refers to a movement among japanese musician that is characterized by the use of eccentric, sometimes flamboyant looks. It usually involve striking make-up, unusual hair styles and elaborate costumes. 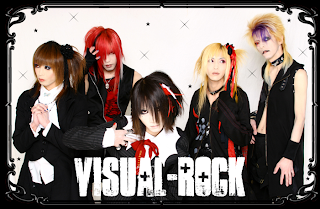 Visual kei can be also refers to a music genre or to a sub-genre of J-rock, with its own particular sound, related to galm rock, punk and metal and with a strong emphasis on its unique style of dress.